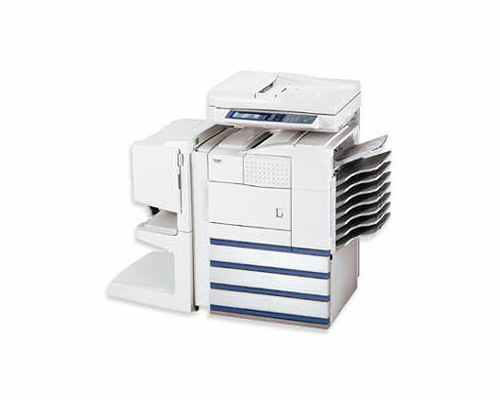 For the medium-size business that needs a high volume multifunction that can fax, scan, and produce high-speed monochrome prints and copies, in 2004 Sharp released the AR-M455U and M455N digital imagers. With speeds up to 45 ppm, the M455’s provides ledger-sized, 2-sided printing at 600 x 600 dpi resolution, simultaneous 2-sided scanning, and document security for sensitive information. The network-ready AR-M455N includes a 40GB hard drive, Ethernet, and PCL6 emulator. All of these features are available to the M455U as options. The primary control panel on the AR-M455 is the large touch-screen LCD display. This User Interface (UI) gives easy access to popular functions, with additional menus for all of the AR-M455’s features. A traditional 10-key fax pad is provided along with the buttons most users are used to using with faxes. Using either Parallel, the low-speed or high-speed USB connections, the AR-M455 can be set up to be a shared printer--provided the computer it’s connected to remains on during the hours the printer would get used. The expandable 128MB of memory allows the all-in-one to easily handle print jobs from many computers. The optional network kit is an available option for the AR-M455U for department-wide printing and remote faxing. M455N owners get networking right out the box. The AR-M455 uses an oversized 11”x17” platen to support scanning ledger or tabloid-sized originals. By scanning the original once and storing the image into memory allows the AR-M455 to produce copies at the rate of 20 pages per minute, up to 999 copies. The 50-sheet automatic document feeder of the AR-M455 can automatically scan 2-sided originals and create 2-sided copies. What’s even more impressive is unlike many Duplex Automatic Document Feeders (DADFs) that have to pull the paper in twice to scan both sided, the AR-M455 has a top and bottom scanner, reducing scan time and paper feed jams. Sizes from 5.5” x 8.5” up to 11” x 17” can be placed singly on the scanning platform, or up to 100 sheets placed on the multi-purpose flip-tray on the side of the copier. Adding the optional paper trays can expand the AR-M455 to supporting up to 3,100 sheets. Another nice feature the AR-M455 has is the ability to physically shift the position of each set of copies in the output tray for easy collating and stapling. This is achieved by pressing the Electronic Sort (or E-Sort) button on the control panel. The multi-page original is scanned first into memory, and then copied out in order. The AR-M455 has three different copy exposure modes & resolutions up to 1,200 x 600 dpi at 256 grayscale levels. The magnification can be automatically or manually changed from 25% to 400% in 1% increments or in 9 preset ratios. Optional Two-tray or Saddle-stitch Finishers for 3-position stapling, center folding for catalogs, 50-sheet stapling capacity. Adding the optional fax kit will give the AR-M455 the ability to send a fax in 2 seconds at resolutions of 400 x 400 dpi with 256 halftone levels. 300 distribution lists and 500 auto-dial numbers can be programmed into the 2MB expandable memory. Sharp has included HP PCL5c and PCL6 print emulators to satisfy the most office demands, with Adobe PostScript3 as an option. The AR-M455U also offers Adobe’s “PDF-Direct” print which enables PDF files to be sent directly to the machine for printing without opening an Acrobat application. Three optional Finishers can give the AR-M455 full publishing features from stapling, 7-bin mail stacking, to saddle-stitch binding for catalogs and magazines up to 8.5” x 11”. To meet regulatory security requirements (i.e. HIPAA, GLB Act), Sharp offers auditing, restrictive network access, and confidential printing by way of assigned passwords. This is a standard with the M455N model and available as the network option for the M455U. Speaking of Adobe products, PostScript is only available as a separate item you must buy. In spite of the fact that the AR-M455 is classified as a copier, considering it’s capacity and MSRP, Sharp should have thrown in the PostScript3 emulator. 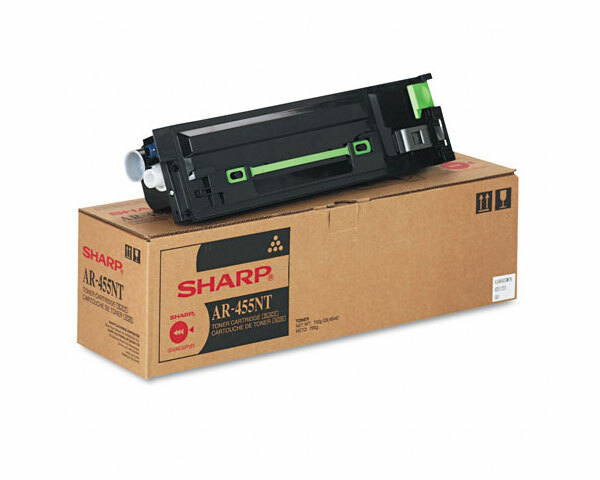 Review it: "Sharp AR-M455 "
The AR-M455 has separated the high-volume toner and drum to help reduce overall consumables costs and maximize drum usage. Unlike smaller copiers and multi-functions, Sharp’s AR-M models don’t require much maintenance in consumables. 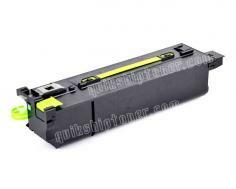 The high-volume toner cartridge yields up to 35,000 pages. The drum unit is good for 200,000 pages and will need to be changed by the 6th toner replacement.